These sweet little squares of pumpkin, marshmallow, and white chocolate create the most delectable little candies. This recipe is a great way to celebrate the changing of the leaves and the parade of (sometimes questionable) Halloween costumes through your neighborhood. It is a great twist on classic chocolate fudge, and the spices combined to make this pumpkin fudge amount to a delicious autumn treat! Preheat oven to 350°F. Spread the nuts onto a baking sheet and place in preheated oven 5-7 minutes until fragrant. Shake the baking sheet halfway through baking so the nuts will toast evenly. Remove nuts from oven and set aside to cool completely. Line a 13 x 9-inch baking pan with parchment or foil letting it extend up the two short sides of the pan and overhang slightly on both ends. In a heavy saucepan, combine sugar, brown sugar, evaporated milk, pumpkin, butter and spices. Bring to a full rolling boil stirring constantly for 10 to 12 minutes. Quickly stir in white chocolate chips, marshmallow fluff, ¾ cup pecans and vanilla extract. Stir vigorously for 1 minute or until morsels are melted. 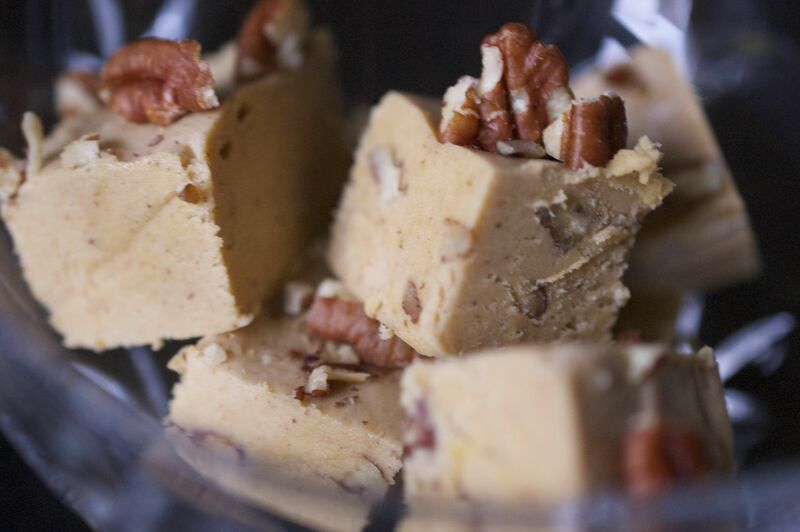 Immediately pour into prepared pan and top with remaining ¼ cup pecans. Let stand on wire rack for 2 hours or until completely cooled. Refrigerate tightly covered. To cut, lift from pan; remove parchment/foil. Cut into 1-inch pieces.